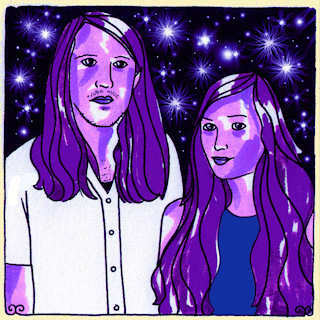 Currently Listening: Cults, Daytrotter Session. | Pulp and Circumstance, Juiced. Currently Listening: Cults, Daytrotter Session. New York band Cults has attracted humble blogger for sometime, and beautifully atmospheric track “Go Outside” even made one of our recent podcasts. So its no wonder I can’t stop playing their gloriously dreamy recent session for Daytrotter, which features the aforemetioned track, as well as “Oh My God” and “The Curse”. It’ll help you get through the Friday afternoon doldrums in work. This entry was posted in Currently Listening, jwolf and tagged cults. Bookmark the permalink.